Hi Everyone. Happy Friday. Here is the reveal of the Master Bedroom and Bath. I like my bedroom to feel like a sanctuary. 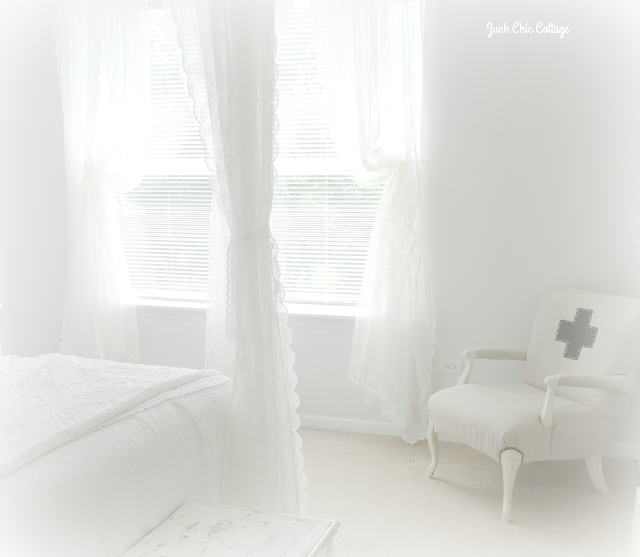 At the end of a day you need a space that is quiet, peaceful and comfy to retreat. Terry made me a canopy out of the ikea shears and some rods he hung from the ceiling. Love the pretty romantic feel the sheers give to the bed. 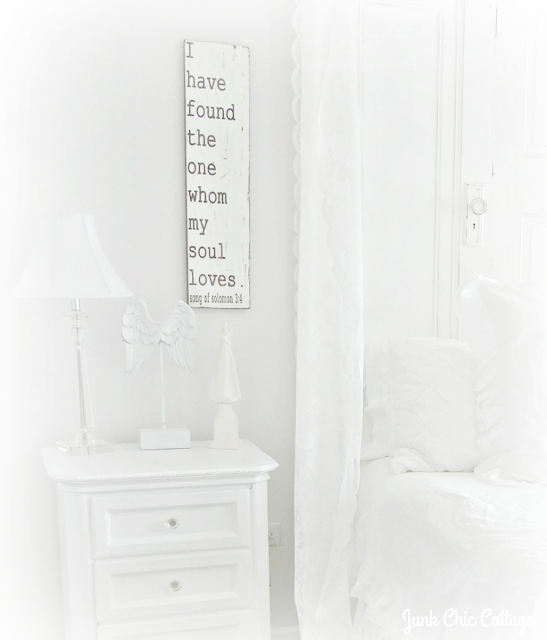 My sleeping angel is hung on this old window and I put it above the old fire place mantel. Simple and sweet. Lots of light filters into this room all day long. Soft and pretty sunshine all day. I hung the vintage door headboard I had at the other house into our new Master Bedroom. 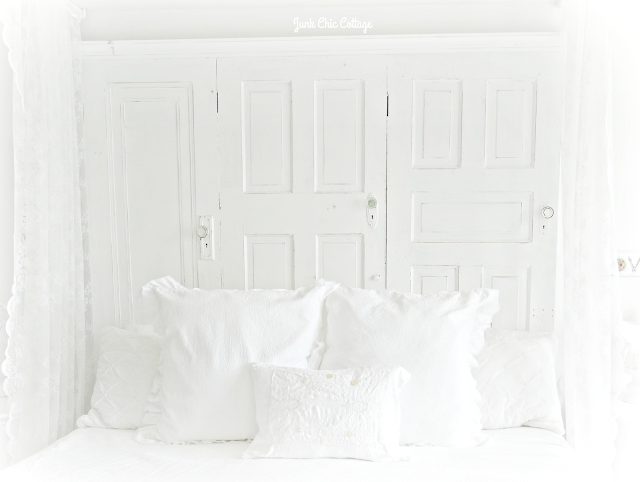 Love those old vintage doors made into a headboard. 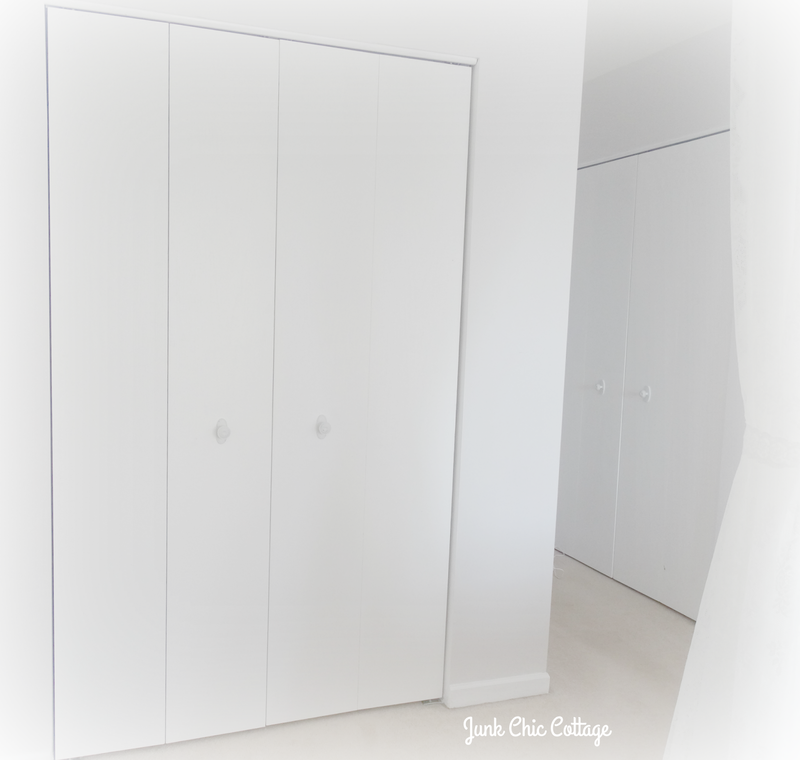 His and Her's closets in the Master Bedroom. Gotta love that!!! After Master Bathroom. Double vanity, painted vanity and the old builders stock mirror gone and two oval white mirrors are now in its place. Hung my chippy chandy's from the old house. I am loving that I found places for all my vintage chandeliers. Terry made this little cabinet fit onto the wall of the double vanity. It hides all the plug ins for the bathroom. Yep hides our sonic care toothbrushes and my make up mirror. My pretty new shower curtain. Love this big window in this master bathroom. Filters light in to this bathroom. Love getting up every morning and the sunshine is streaming into the bathroom. Thanks for your visit. Have a great week end. Very hot and humid here in Illinois but I am still loving that it is summer!!!! Gorgeous. I love the hanging curtains around the bed. Can you do a tutorial on that? Also love that you found places for your chandeliers. So, so pretty. I have to agree with everyone - it's gorgeous and you certainly have put your style into your lovely new home. You are so lucky to have Terry who is so talented with making and fixing everything. You guys are a terrific team. So pretty. I think you have done an amazing job with your new home. So lovely! I see you're settling into your new home just fine. Now that the kitchen is redone, we are looking at redoing the master a bit. Soooooo... I am about the canopy. WANT!!!! It is beautiful Kris!!! There's nothing you two couldn't do together! Love the bed curtains and the simplicity. Okay the headboard too! Such a pretty bathroom. And so much light! Nice job! Absolutely stunning!!!! 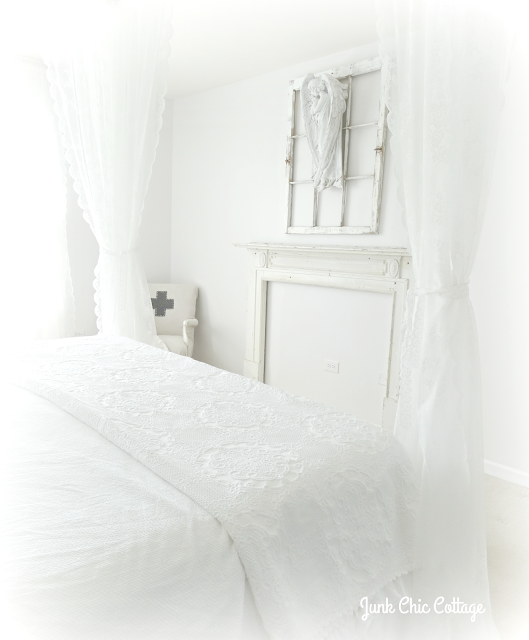 Everything is so light and airy....I love the bed canopy!!!! It is over 100* here today and I am waaaay over summer and very ready for fall!!!! Wow, wow, wow. What a lovely sanctuary, Kris. Love those chandeliers in your new space. You are just motoring along! Is the whole house done already??? It looks lovely! 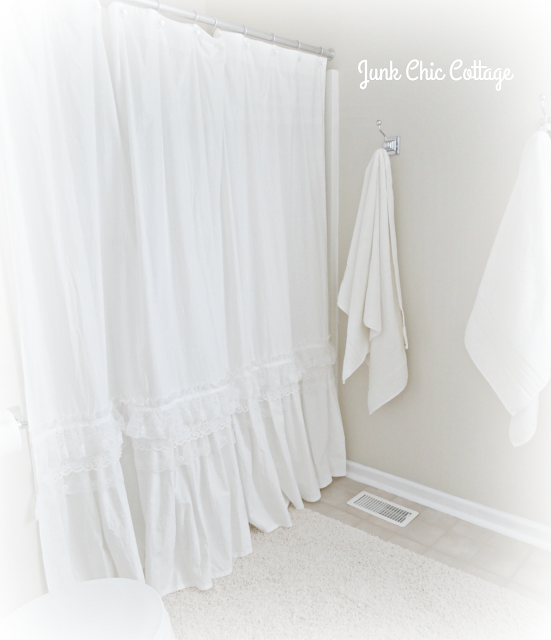 Your new master bedroom and bathroom are so refreshing! It's wonderful that you were able to use your "old door" headboard again. Beautiful job! Definitely can see you in the master bedroom/bedroom. It looks lovely... FYI...one day you might wake up and find all your shanties missing. It makes be really feeling like home now! so very serene. Great use of the chandies for over sink mirrors. As usual you have made an inviting place. Hope you are enjoying your summer. Wow, Kris my first thought is that your room would be like walking into a cloud or sleeping in a cloud. I do love it! 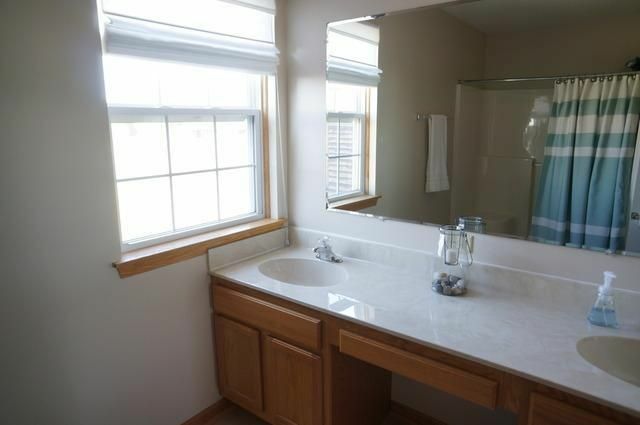 Isn't it amazing the difference the white cabinets make in your bathroom? I love your pretty white accessories, too. You are so talented! So restful and pretty! I know you must enjoy this space a great deal. Kris, you and I are so lucky to be married to handy men! Your bed is beautiful! 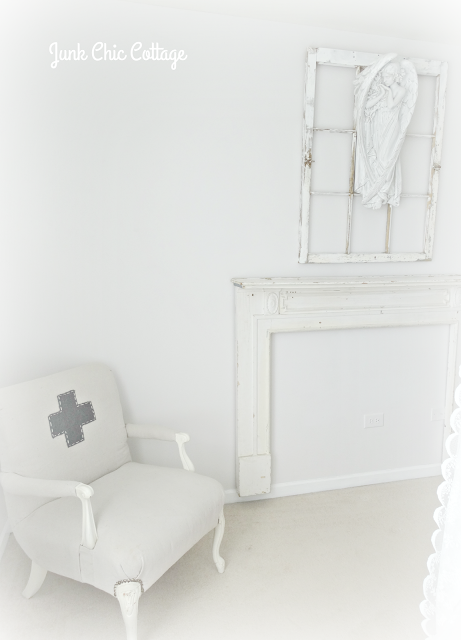 I also adore the chair with the cross on it. You've created a gorgeous sanctuary, Kris! Your bed is lovely, and I'm loving the mantel hung in your bedroom. Very soft and peaceful. Love all the special touches throughout with the old doors, etc. Gotta love our men and their tools, huh? I LOVE what Terry did for you to hang those sheers over the bed. This reminds me of the fact that it was MY HUSBAND who first put out the idea to hang sheers over our bed! I went with that idea REAL quick! Your bedroom is perfection. Absolute perfection. 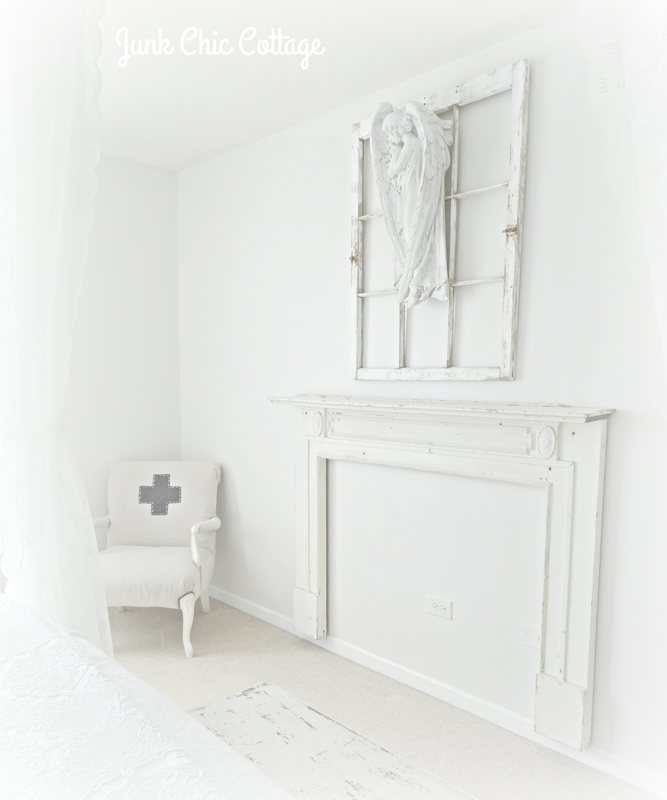 A bedroom should be a place you melt into , and what better backdrop but a white one. LOVE LOVE LOVE. Thank you as well for coming to visit my post! Thank you for coming along. Have a great week end. Oh my Kris, it is absolutely gorgeous! What a beautiful space to land in at the end of a busy day. You and Terry are a great team. Your home is becoming "you" and I love it all. Kris, I fall in love more and more. Headboard gorgeous, bathroom beautiful. Adore the frame around the sconces. Everything looks so beautiful Kris. Your home is really evolving into a "Kris" look. Your bedroom and bath look so pretty! It's like you're sleeping in the clouds with all of the soft white everywhere. 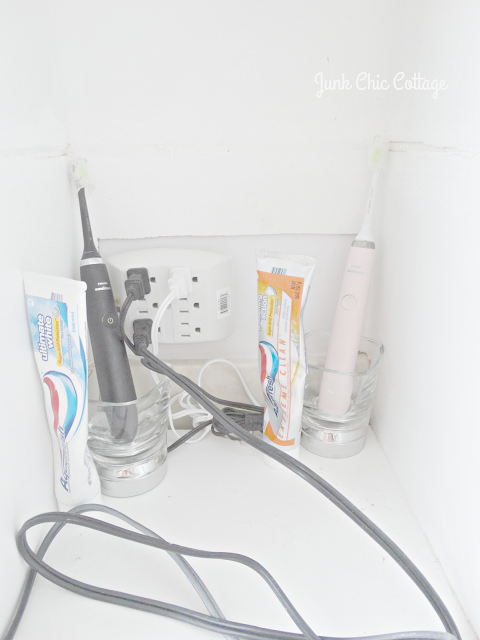 The cabinet that your husband added to the bathroom vanity was a nice way to add attractive storage. Your bedroom looks like a perfect place to curl up and have sweet dreams. I do love your bathroom. I absolutely love that sign in your bedroom! Everything looks great, you are truly settled in now, Kris! You must never want to leave your home Kris?! Everything is beyond lovely...the sconces, mirrors,made...truly it's all beautiful. I'm sure you're settling in and feeling a lot more at home now. Kris, I love the peaceful retreat you & Terry have made in your MBR and Bath. 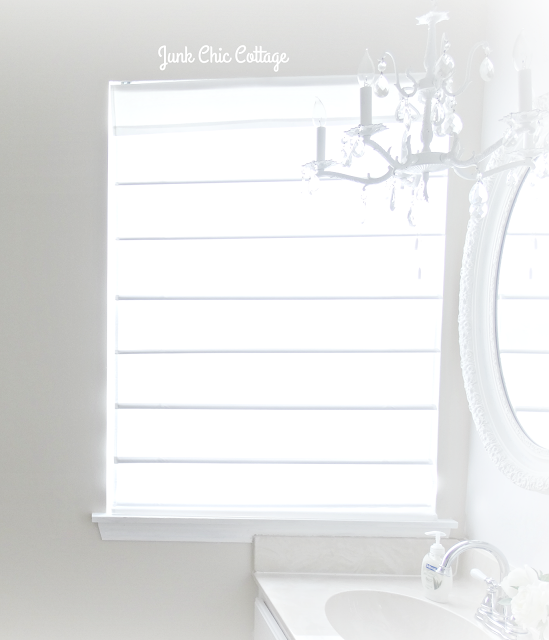 I bet you love that sunlight coming through the windows on all that dreamy white! Morning is my favorite time of day, and having the light come in just makes my soul happy. The canopy, mantel and angel above it are highlights for me. In the bath (which looks NOTHING like its former, builder-grade self! 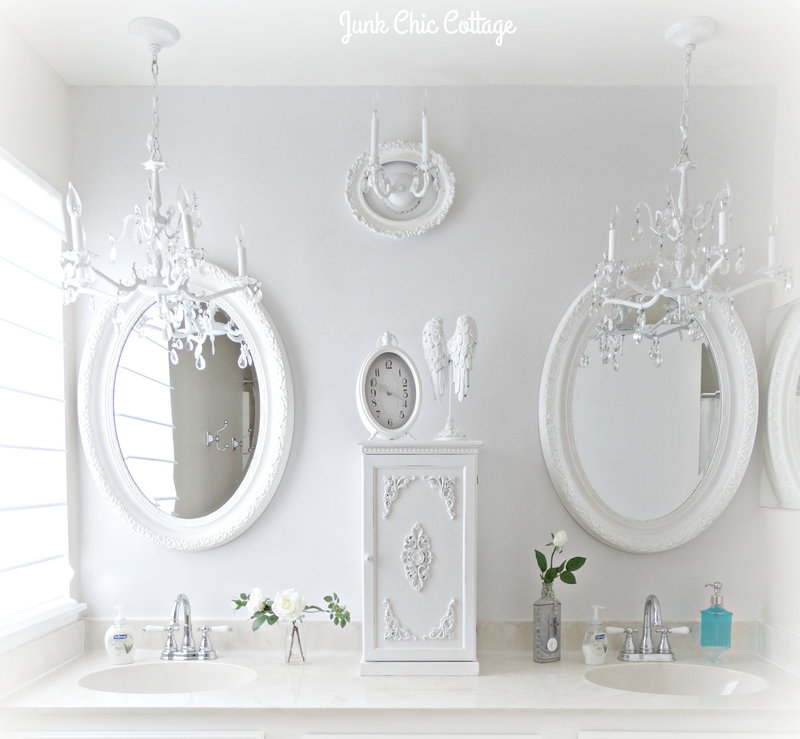 ), I love the separation of space with the vanity and how you did that with the mirrors and chandeliers above them. That cabinet in between is another brilliant idea. The shower curtain you gave us a peak of earlier looks really, really good with it all. Welcome home, and sweet dreams! That canopy!!! Oh my goodness, such a beautiful addition! The bathroom mirrors and new lighting add so much goodness to your pretty space. It's all so lovely! It's very stunning Kris..it is very peaceful and beautiful.. with so many gorgeous, personal details. I'm so happy to see you busy as a bee again doing what you love! The bedroom and bath are just amazing. Your magic never ceases to astonish and inspire me. :) Have a wonderful week and thank you for sharing! Your bathroom and bedroom are both gorgeous, Kris! What amazing transformations! I love the way you hid your plug-ins! I'm glad you are loving where you are, your home is just beautiful! This summer has been the best, hasn't it??!! What is the wall paint color you are using? As a long to me fan, I feel like I should know the answer. Kris, everything is just gorgeous! No home is ever the same once you get a hold of it. lol! I have an ugly mirror like that in our master bath and would like to take it down some day. 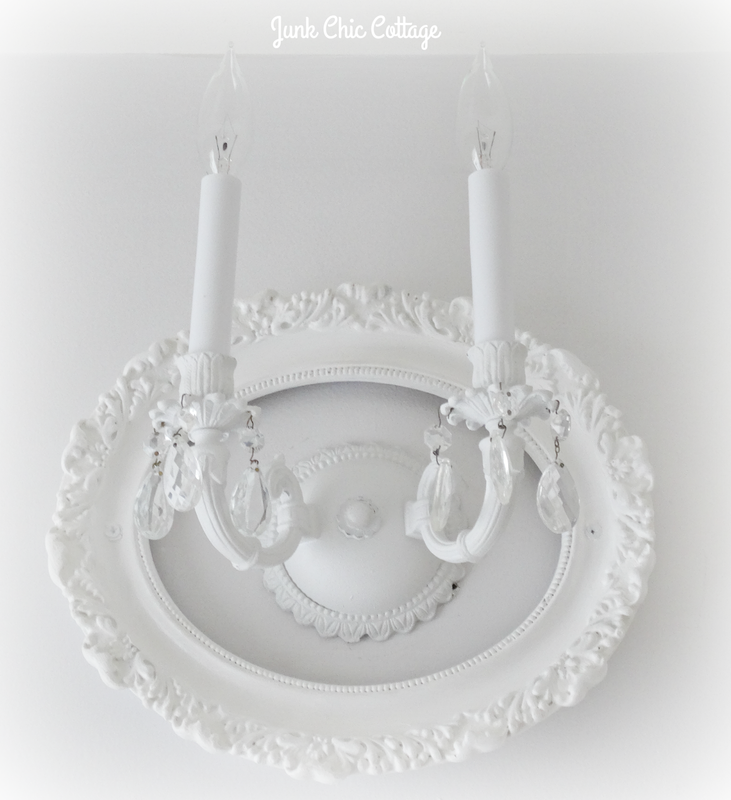 Love your double chandy's. Both your bed and bath are just stunning! It's amazing Kris, the progress you have made in transforming your home from bland to wow! The bed canopy must feel so romantic to climb I to on these wam summer nights. What next is whirling around in your pretty little head? Looking forward to what your next project is? Wow, wow, wow, wow, wow!! Your bedroom is soooo dreamy! It is beautiful! 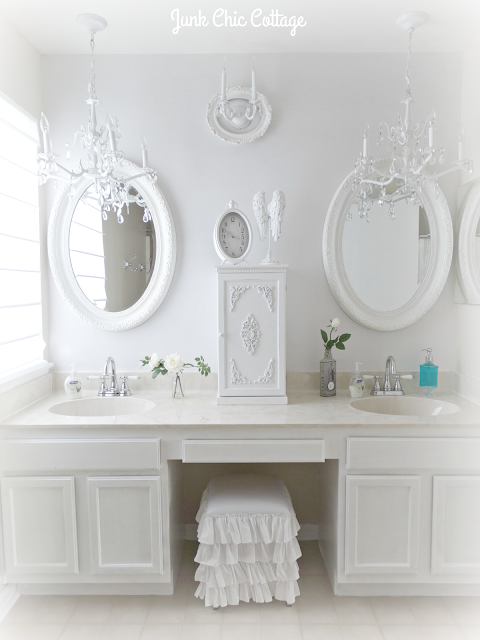 Your master bathroom is totally transformed into such a lovely, elegant space! Amazing work! Love the verse on the wall! That's been a long time favorite of mine!! Everything is so dreamy!! Hi Kris, Oh the transformation is gorgeous. I love how your master turned out in your signature white and the details are stunning. Love the angel over the mantel. Beautiful style with the canopy too. So pretty with Ikea sheers. Aren't they nice? I have purchase them too and love the long lengths and delicate designs they carry. Your bath is beautiful too and the streaming light coming through that big window is awesome. Love the mirrors and the hideaway cabinet. You two have really done a wonderful job and everything is magazine ready my friend. Love it all. Beautiful, beautiful, beautiful! You must be so happy to feel at home again. You and Terry have done such a great job of transforming the new house and recreating your signature look. It'w wonderful! You two created a most beautiful and blissful sanctuary. Terry did a fabulous job as always from that gorgeous canopy of sheers to hanging that cute cabinet for all of your "electronics" and you adding your signature touch on all of the beautiful details in the room!....What a transformation of the bathroom based on that photo....You two have done so much in such a short amount of time. Bravo!!! Hello Kris, wow it is so gorgeous and looks like a B&B. You both did such a great job with it and the rest of the house. I hope you will both have happy times together there. Enjoy the week. Another beautiful room for sure. Can't say enough about your man Terry,he can do anything. What will you guys do when there is no more painting or work to do? Absolutely gorgeous Kris. You and Terry make such a fabulous team and this home will be even more beautiful than the last, which seemed impossible. Your master bedroom appears so tranquil and how spectacular is the bathroom swap out with those mirrors. Amazing!!! Everything looks beautiful - looks like you all are getting settled in. You and Terry are an amazing team - you should start a decorating/re-purposing business. I would hire you in a minute. Looking beautiful Kris! You can not beat those Ikea lace panels. I used them in our home. Hoping to find a vintage mantel for our master at some point in time. I'm trying to catch up with my blog reading and it's a pleasure to find your bedroom and bathroom. 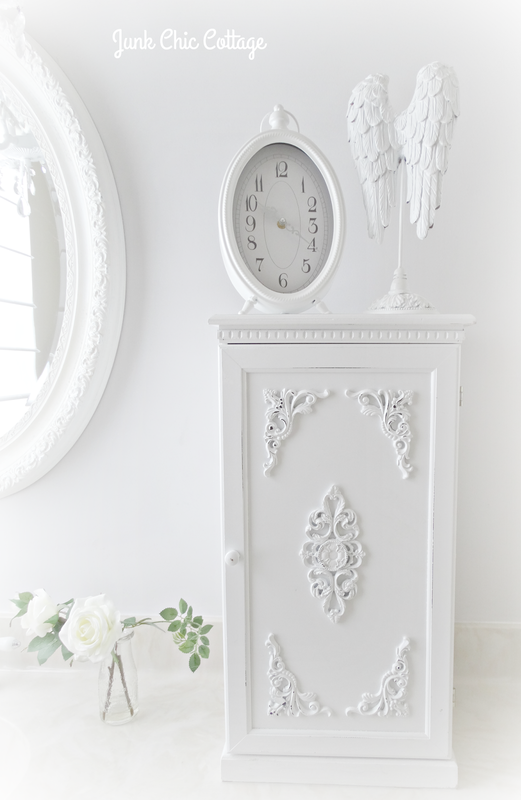 I love the mantel facing your bed, so much charm. And the idea of the cabinet to hide the plugs on the vanity is genius.